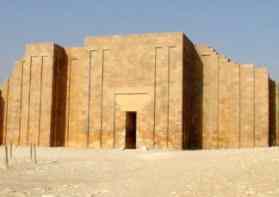 Saqqara (Saccara or Sacarrah) is a desolate patch of desert west of the Nile and 9 miles (14 km) south of Cairo. 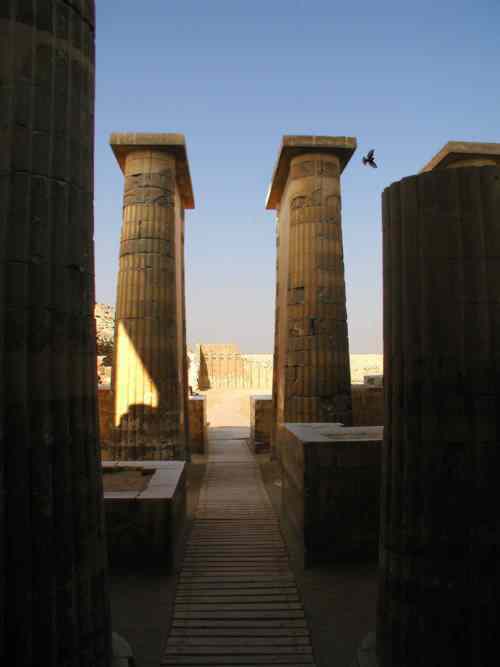 It is close to the Ancient Egyptian capital of Memphis and contains burials from much of Egypt's history. 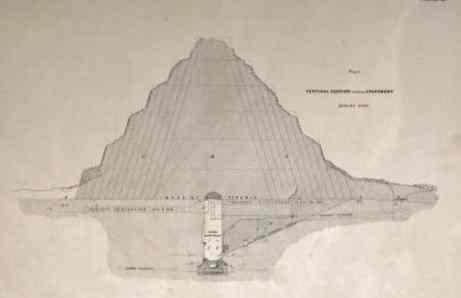 Saqqara took the name of Sokar, the Old Kingdom god of orientation (measurement of location), and there are theories that the ancient surveys of all Egypt took the Pyramid of Djoser at Saqqara as their starting point. 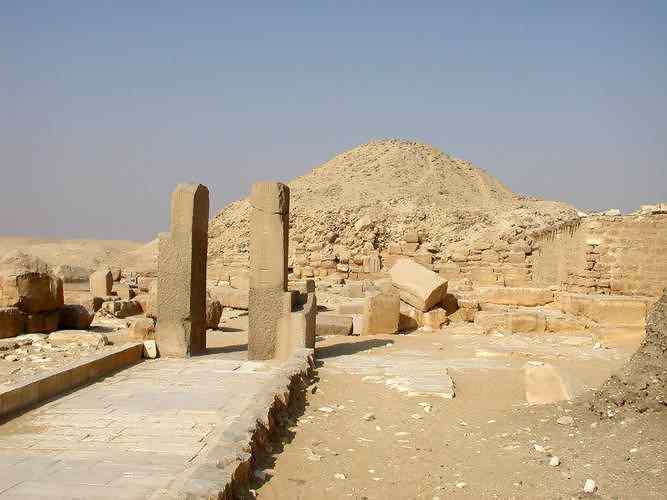 Pharaoh Djoser (Zoser or Netjerikhet) (ruled 2668-2649 BC) built the world's first Pyramid here, or more correctly his architect, Imhotep (Imuthes), designed the structure that today dominates the region. Along with the 210 foot tall Pyramid, the 37 acre (15 ha) (544 X 277 meters) complex recreates the Royal Palace in finely finished and detailed stone with a number of buildings, columns and shrines, some of them only facades. bright in the sunshine, and a part of the original perimeter wall. Storehouses and the Heb Sed courtyard. The enclosure includes a courtyard for the thirty-year Sed celebration. This featured the Pharaoh running a short course. This rejuvenates him to rule for another 30 years. Thus Djoser planned to rule for eternity. Below the Step Pyramid of Djoser is a multi-layered warren of tunnels and chambers. Those explored have yielded hundreds of alabaster jars. Much of the system is too close to collapse for humans to enter. 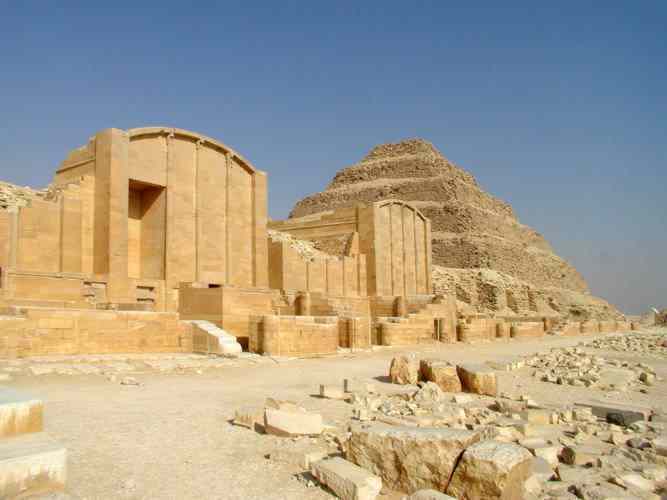 Djoser Pyramid complex photographs are from EgyptArchive. The Gisr el Mudir (enclosure of the boss) is a sand covered rectangle west of Djoser's Step Pyramid. The walls enclose an area 1150 by 2130 feet (350 X 650 meters), much larger than Djoser's complex. The walls are of roughly finished stone blocks filled with rubble and are 15 feet high and 50 feet thick. This huge construction is as yet only minimally excavated. It is suspected to have been built by Pharaoh Khasekhemwy (ruled ?-2685 BC) who reigned before Djoser, perhaps immediately before. The stone enclosure found at the Gisr el Mudir and Khasekhemwy's complex at Abydos are large projects that entailed a high level of organization, yet the use of mud-brick at Abydos and fairly small, roughly cut stones at Saqqara show a greatly inferior technology. Still there was a quickening at Khasekhemwy's time, of new ideas, greater wealth, or both. The Causeway, Temple and Pyramid of Unis. 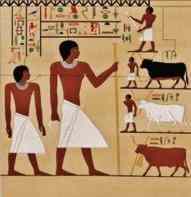 Pharaoh Unas (Unis, Oenas or Wenis) (ruled 2375-2345 BC) also built his Pyramid at Saqqara. Inside he placed an undecorated black basalt sarcophagus and built the walls of his burial chamber of fine cream colored alabaster (calcite) carved and painted to resemble a sacred tent with a ceiling of golden stars. Here, in a triangular section above his coffin, was carved the first known example of the "Pyramid Texts", careful instructions on overcoming the obstacles of the next world, that in the New Kingdom would evolve into the "Book of the Dead". 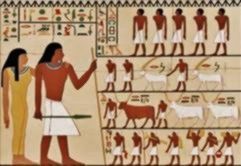 Hieroglyphic writing is a well crafted system that changed very little over two thousand years. Yet only fragments have been found from earlier dates than this. Three hundred years earlier Imhotep had "read the ancient scrolls" at Heliopolis. 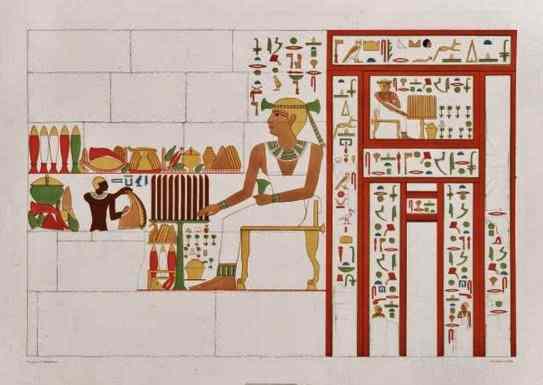 Hieroglyphic writing may have been a temple secret for centuries. There are stories of another, secret and sacred level of meaning. The second to the outside gold screen surrounding Tutankhamen's burial is partly covered with untranslatable hieroglyphic writing. Known passages from the Book of the Dead and other texts are written normally between sections of unknown meaning, leading to the conclusion that this is something very different. Similar texts have been found in the tombs of Ramesses V and Ramesses IX. 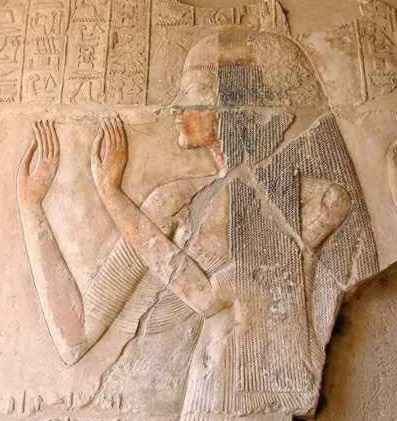 Unas was the last Pharaoh of the Fifth Dynasty. By then the grand projects of two hundred years before were impossible. 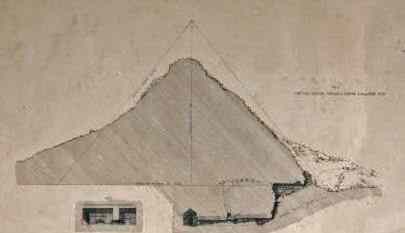 Pharaoh Unas built a small pyramid, with small stones. Unas Pyramid photographs from EgyptArchive. Mastaba at Saqqara 2503-2498 BCE. Ibi - Eighth Dynasty - c.2165 BCE. Merenre - Sixth Dynasty - 2283-2278 BCE. Djedkare Isesi - Fifth Dynasty - 2414-2375 BCE. Pepi I Meryre - Sixth Dynasty - 2332-2283 BCE. 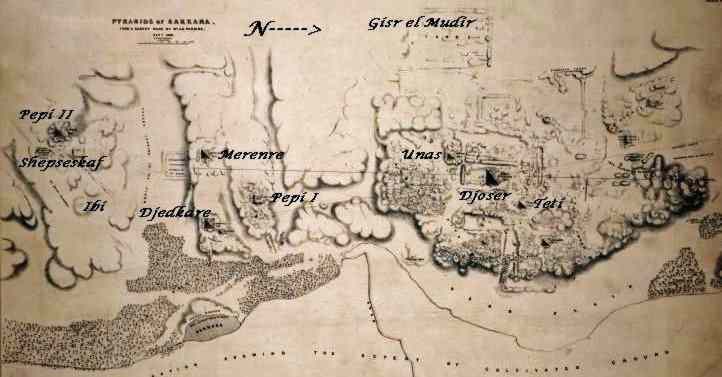 likely built the Gisr el Mudir ?-2686 BCE. un-mapped, located above the name "Unas". 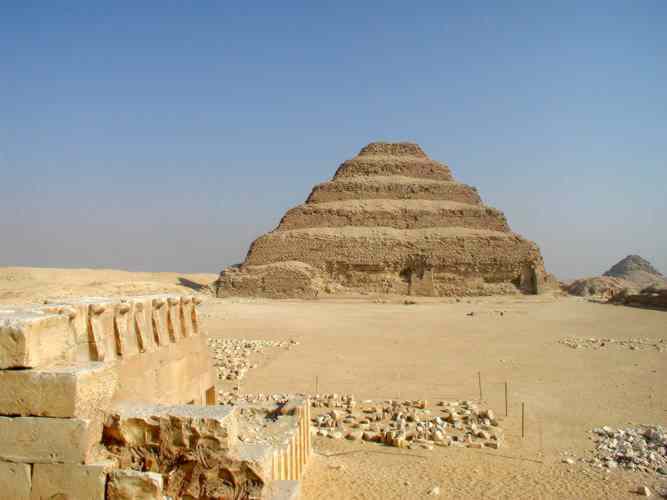 Unfinished step pyramid, 377 ft (100 m) square, intended 230 ft high, only about 40 ft was constructed. Dressed stone enclosure similar to Djoser's, 1850 by 607 ft and 33 ft high. 2649-2643 BCE. Unas - Fifth dynasty - 2375-2345 BCE. Djoser - Third Dynasty - 2668-2649 BCE. Teti - Sixth Dynasty - 2345-2333 BCE. just North East of Djoser 2498-2491 BCE. re-discovered in 2008 2422-2414 BCE. Khendjer - 13th Dynasty - Off the map to the South. c.1765 BCE. both in art and in real supplies. until recently, the wall art was thought worthless. Engravings by Ernst Weidenbach 1850. Meryt, Wife of Maya. Tomb at Saqqara. 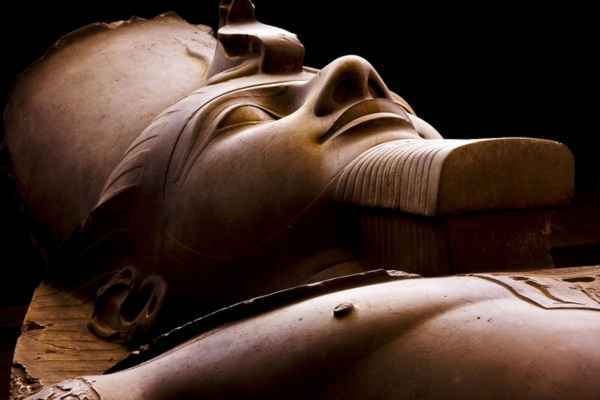 Giant statue of Ramsses II, at Memphis. Photograph by Ian Sherlock, CreativeCommons. Located a few miles south of modern Cairo, the Old Kingdom capitol city of Memphis, once the greatest in the world, now offers little for the traveler to see. There might be potential here, under the sands, as the story below would indicate. 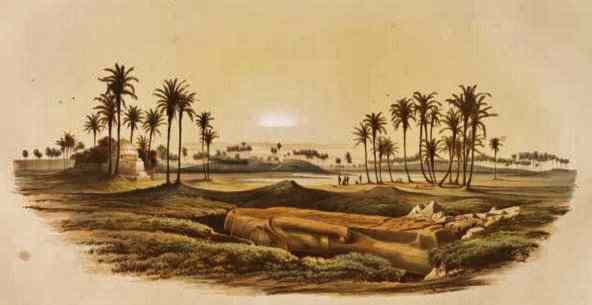 On the way, Achmet had told us of a Frenchman who had been all summer digging in the sand, near Sakkara. Soon we saw before us the residence of this Frenchman; a mud hut on a high sand-bank. It was an unfortunate building, for nearly all the front wall had tumbled down, revealing the contents of his kitchen. One or two Arabs loitered about, but a large number were employed at the end of a long trench which extended to the hills. Before reaching the house a number of deep pits barred our path, and the loose sand, stirred by our feet, slid back into the bottom, as if eager to hide the wonders they disclosed. Pavements, fresh as when first laid; basement-walls of white marble, steps, doorways, pedestals and fragments of pillars glittered in the sun, which, after the lapse of more than two thousand years, beheld them again. I slid down the side of the pit and walked in the streets of Memphis. The pavement of bitumen, which once covered the stone blocks, apparently to protect them and deaden the noise of horses and chariots, was entire in many places. Here a marble sphinx sat at the base of a temple, and stared abstractedly before her; there a sculptured cornice, with heavy mouldings, leaned against the walls of the chamber into which it had fallen, and over all were scattered fragments of glazed and painted tiles and sculptured alabaster. The principal street was narrow, and was apparently occupied by private dwellings, but at its extremity were the basement-walls of a spacious edifice. All the pits opened on pavements and walls, so fresh and cleanly cut, that they seemed rather the foundations of a new city, laid yesterday, than the remains of one of the oldest capitals of the world. (Left) Statue of Rameses II and the god Ptah, from Memphis. Ny Carlsberg Glyptothek museum in Copenhagen. Photograph by Wolfgang Sauber, CreativeCommons. We approached the workmen, where we met the discoverer of Memphis, M. Auguste Mariette. On finding we were not Englishmen (of whose visits he appeared to be rather shy), he became very courteous and communicative. He apologized for the little he had to show us, since on account of the vandalism of local people, he was obliged to cover up all his discoveries, after making his drawings and measurements. The Egyptian authorities were worse than apathetic, for they would not hesitate to burn the sphinxes for lime, and build barracks for filthy soldiers with the marble blocks. 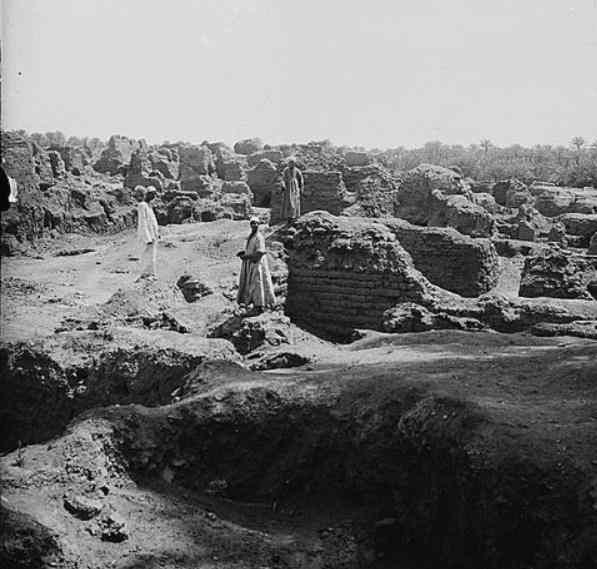 Besides this, the French influence at Cairo was then entirely overshadowed by that of England, and although M. Mariette was supported in his labors by the French Academy, and a subscription headed by Louis Napoleon’s name, he was forced to be content with the simple permission to dig out these remarkable ruins and describe them. He could neither protect them nor remove the portable sculptures and inscriptions, and therefore preferred giving them again into the safe keeping of the sand. Here they will be secure from injury, until some more fortunate period, when, possibly, the lost Memphis may be entirely given to the world, as fresh as Pompeii, and far more grand and imposing. I asked M. Mariette what first induced him to dig for Memphis in that spot, since antiquarians had fixed upon the mounds near Mitrahenny (a village in the plain below, about four miles distant), as the former site of the city. He said that the tenor of an inscription which he found on one of the blocks quarried out of these mounds, induced him to believe that the principal part of the city lay to the west, and therefore he commenced excavating in the nearest sand-hill in that direction. After sinking pits in various places he struck on an avenue of sphinxes, the clue to all his after discoveries. Following this, he came upon the remains of a temple (probably the Serapeum, or Temple of Serapis, mentioned by Strabo), and afterward upon streets, colonnades, public and private edifices, and all other signs of a great city. The number of sphinxes alone, buried under these high sand-drifts, amounted to two thousand, and he had frequently uncovered twenty or thirty in a day. He estimated the entire number of statues, inscriptions and reliefs, at between four and five thousand. During thirteen months of assiduous labor, with but one assistant, he had made drawings of all these objects and forwarded them to Paris. In order to be near at hand, he had built an Arab house of unburnt bricks, the walls of which had just tumbled down for the third time. His workmen were then engaged in clearing away the sand from the dwelling of some old Memphian, and he intended spreading his roof over the massive walls, and making his residence in the exhumed city. The 35 foot statue of Ramsses II as it was discovered. stood for 50 years in front of the Cairo railway station, an imposing sight. That statue will soon mark the entrance to the new Egyptian museum. The man’s appearance showed what he had undergone, and gave me an idea of the extraordinary zeal and patience required to make a successful antiquarian. His face was brown, his eyes severely inflamed, and his hands as rough as a bricklayer’s. His manner with the native workmen was admirable, and they labored with a hearty good-will which almost supplied the want of the needful implements. All they had were straw baskets, which they filled with a shovel, and then handed up to be carried off on the heads of others. One of the principal workmen was deaf and dumb, but the funniest Arab I ever saw. He was constantly playing off his jokes on those who were too slow or too negligent. An unlucky girl, stooping down at the wrong time to lift a basket of sand, received the contents of another on her head, and her indignant outcry was hailed by the rest with screams of laughter. I saw the same man pick out of the sand a glazed tile containing hieroglyphic characters. The gravity with which he held it before him, feigning to peruse it, occasionally nodding his head, as if to say, “Well done for old Pharaoh!” could not have been excelled. Strabo states that Memphis had a circumference of seventeen miles, and therefore both M. Mariette and the antiquarians are right. The mounds of Mitrahenny probably mark the eastern portion of the city, while its western limit extended beyond the Pyramids of Sakkara, and included in its suburbs those of Abousir and Dashoor. The space explored by M. Mariette is about a mile and a half in length, and somewhat more than half a mile in breadth. 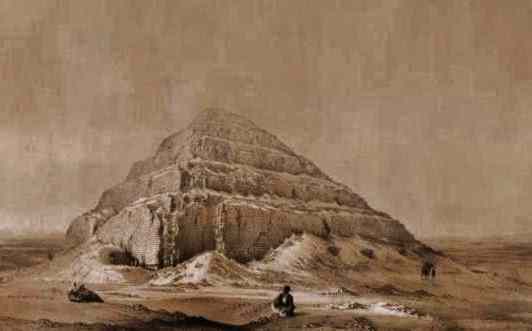 He was then continuing his excavations westward, and had almost reached the first ridge of the Libyan Hills, without finding the termination of the ruins. 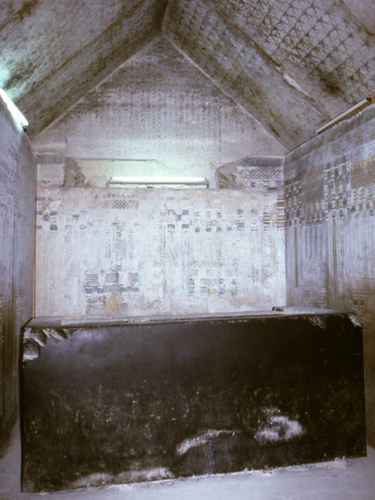 A few months after my visit, his labors were further rewarded by finding thirteen colossal sarcophagi of black marble. Yet at that time, the exhumation of lost Memphis was unknown in Europe, except to a few savans in Paris, and the first intimation which some of my friends in Cairo and Alexandria had of it was my own account of my visit in the newspapers they received from America. But M. Mariette is a young man, and will yet see his name inscribed beside those of Burckhardt, Belzoni and Layard. We had still a long ride before us, and I took leave of Memphis and its discoverer, promising to revisit him on my return from Khartoum. Photograph from the American Colony in Jerusalem.